Suspended light fixtures are almost like snowflakes or fingerprints -- no two are exactly alike. Take Three Lighting offers a vast selection of different styles of suspended lighting to suite your tastes and your design, from single and multi-light pendants to intricate chandelier to commercial linear suspended fixtures. Featuring name brands such as Maxim Lighting, ET2, Access Lighting, Kuzco, H.E. Williams, and many more. Contact us today and let us assemble a custom quote for your bulk suspended lighting needs. The three terms can seem interchangeable, and a little confusing, at first. All refer to light fixtures that are hung from the ceiling. But there differences in terms of the size, complexity, and purpose of each type of lighting. A pendant light is a smaller, single lighting fixture that is hung from the ceiling and usually designed for task lighting. They are often simpler in design and project their light output mostly downward to illuminate or highlight a surface below. Think of the light fixtures suspended over a kitchen island; these are pendant lights. Pendants are often installed together in groups. 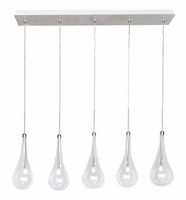 Some pendant fixtures are comprised of multiple smaller pendants grouped together as one single, larger fixture. These multiple-light pendants tend to be bigger than single-light pendants and act as a sort of hybrid, bridging the gap between pendants and chandeliers. A chandelier, on the other hand, tends to be a larger luminaire that is designed to provide general illumination in a room (though often not the only source of illumination). Chandeliers not only tend to be physically bigger than pendants, and have more light output from multiple light sources, but they also have more complicated designs, often with multiple tiers of lights comprising a single fixture. They are considered a more ornate and formal lighting choice over pendants. Think of the old crystal chandelier that hung over your grandmother's dining room table or the extremely large and complex fixture suspended from the ceiling in a hotel lobby; these are chandeliers. Essentially, chandeliers are very styled and are designed to be a focal point in the room. 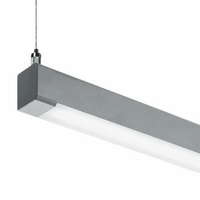 A suspended linear fixture, is often a long and narrow suspended architectural multi-purpose luminaire that can provide task lighting, general illumination lighting, and ambient lighting in space through the use of down-lighting, up-lighting, or both. Due to their wide range of applications, many linear fixtures are highly customizable. Please contact us for additional suspended linear fixture options. Linear fixtures are often used more in commercial environments such as over large conference room tables, in classrooms, and in open office spaces. LED pendant, chandelier, and linear lights are energy efficient, giving you the opportunity to save hundreds on your yearly electrical costs. Whether you want a single light or multiple lights suspended from your ceiling, there are so many suspended lighting options to choose from that you're bound to find exactly the right fit for your particular space. Whether you want simplicity or elegance, soft illumination or brilliance, you'll find it all when you shop for pendants and chandeliers at Take Three Lighting. If you need help finding the right pendant, contact us today and one of our lighting experts will help guide you through the deep catalog of products available from our manufacturers.